In 2015, the Centers for Disease Control and Prevention (CDC) conducted a National Youth Tobacco Survey and found that 2.39 million teens are “vaping” (i.e., using an electronic smoking device). As this trend continues to grow, parents, schools and health professionals struggle with ways to effectively address the problem. William T. Mautz, Ph.D, of Children’s Neuropsychological Services in Andover, Arlington and Newton, Massachusetts and Exeter, New Hampshire, indicated that his practice treats a large teen population from both public and independent schools and the problem of vaping cuts across all settings. He explained that teens don’t recognize the dangers involved with this practice but are drawn to vaping after watching social media videos of their friends. “When kids see a friend take a “hit” on Instagram, it piques their interest,” he said. While these electronic devices were originally marketed to adults seeking to stop using combustible tobacco, the design from companies like Juul attracts the teen set. Colorful and available in flavors such as gummy bears, watermelon and tutti frutti, the device resembles a flash drive or a pen that can easily be hidden in a pocket or between the fingers. “It’s very easy to take a hit discreetly,” said Mautz. More troubling is the fact that some teens are putting marijuana into the electronic device to achieve a “super high,” according to Mautz. These teens believe they are getting a “clean high,” i.e., a huge buzz that still allows them to function. In the past, ads that explicitly showed the dangers of tobacco smoking helped to raise awareness of the dangers. But nowadays, there are no super athletes or rock stars talking about the dangers of vaping, Mautz noted. However, schools have been aware and on top of the issue for the last two or three years. School districts are implementing regulations and imposing penalties for students who are caught vaping, Mautz said. Nicholas Chadi, M.D., pediatrician specializing in Adolescent Medicine, and first and only Pediatric Addictions Fellow in North America, is currently involved in the Adolescent Substance Use and Addiction Program (ASAP) at Boston Children’s Hospital. He reported that vaping negatively has serious physical consequences. In the past two months, leading pediatric journals have published two studies that show e-cigarettes contain multiple cancer-causing substance and heavy metals that scar the lungs, according to Chadi. Chadi has noticed that some teens are using e-cigarettes so much that they are experiencing withdrawal symptoms. He pointed out that the Juul pods contain nicotine equivalent to a whole pack of cigarettes. “Some kids go through up to four pods a day,” he added. While marketing for these products has been aggressive, having an equally robust education movement is necessary to enlighten public health providers and schools about the risks, Chadi said. 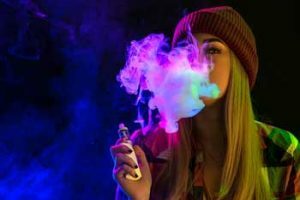 Psychologists with young patients addicted to vaping might want to offer counseling or refer them to specific addiction programs, Chadi suggested. He noted that pediatricians support the use of nicotine replacement therapy such as lozenges or patches to help the teen cut down or quit. These options have been determined safe for use in adolescents, although there is limited data on how effective they are in this patient population.